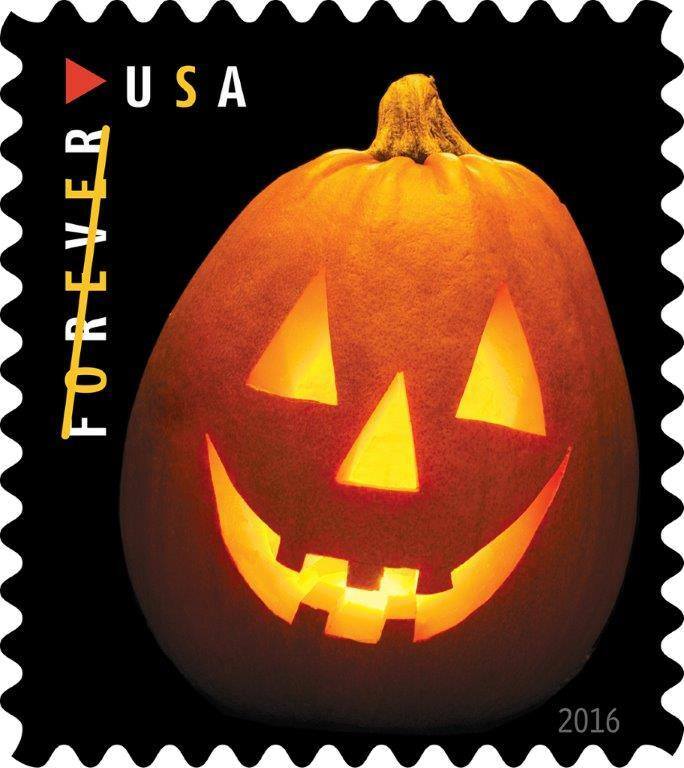 It is hard to believe that the United States Postal Service has never issued an official Halloween stamp series, but that is about to change this year with the release of a collection of four new stamps each featuring a differently carved grinning jack o lantern. As reported at Linn’s Stamp News, the stamps will be issued in a double-sided pane of 20, which the Postal Service calls a booklet. as well as press sheets consisting of six panes with die cuts (120 stamps), selling through its Stamp Fulfillment Services division for face value at $56.40. The four different jack-o-lanterns featured on the stamps were carved by Paul Montanari and photographed by Sally Andersen-Bruce, as designed by art director Derry Noyes. The first-day ceremony for the new Jack-O’-Lantern forever stamps will take place on Thursday, September 29 in Anoka, Minnesota.